Accedo Broadband, provider of IPTV and Connected TV applications, and Ekioh, provider of browsers and SVG engines have confirmed the availability of casual games in 3D using Ekioh’s latest SVG software. 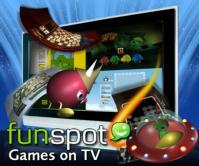 Accedo’s Funspot game service is the most widely deployed IPTV game service in the world and contains more than 100 casual games in various categories. The 3D games will be available for all Ekioh customers from Q3 2011. Ekioh’s stereoscopic 3D engine has been released to a closed set of customers and partners and will be widely available on the market from Q2 2011. The Ekioh engine is flexible and allows for integration into most middlewares and devices.